Sebastian has released nine top ten albums, including two number ones. The first seven all gained either platinum or multi-platinum certification. He has also achieved twenty one top twenty singles, with twelve reaching the top ten, including six number ones. He is the only Australian male artist in Australian chart history to achieve six number one singles, and places third overall for all Australian acts. Eight of his singles have been certified multi-platinum, including the 11× platinum "Battle Scars". His debut single "Angels Brought Me Here" was the highest selling song in Australia last decade. With 61 platinum and six gold certifications and combined album and single sales of over 4.4 million in Australia, he has the highest certifications and sales of any Australian Idol contestant. Sebastian has worked with a number of notable American musicians, including Brian McKnight, Robin Thicke, Steve Cropper, John Mayer, Jordin Sparks, Eve and Lupe Fiasco. "Battle Scars", a collaboration with Fiasco, spent 20 weeks on the US Billboard Hot 100 chart, peaking at number 71 and achieved platinum certification. "Battle Scars" also reached number two in Norway and New Zealand. Sebastian has reached the top ten in New Zealand with an album and six singles, including two number ones, and gained six platinum and three gold certifications there. In 2015 his Eurovision song charted in the top 50 in five European countries. During his career Sebastian has received 28 ARIA Award nominations, winning four including Best Pop Release and Best Live Act. Other awards include the APRA Urban Work of the Year, the [V] Oz Artist of the Year, Urban Music Awards for Best Male Artist and Best R&B Album, and an International Songwriting Competition award for "Battle Scars". Sebastian has sung at many notable events, including performing for Pope Benedict XVI, Oprah Winfrey and Queen Elizabeth II. He has a strong commitment to charity, he was previously an ambassador for World Vision Australia and the Australian Red Cross and has created his own foundation, The Sebastian Foundation, with his wife Jules. Guy Sebastian was born in Klang, Selangor, Malaysia, on 26 October 1981. His father Ivan was also born in Malaysia and is an ethnic Malaysian Indian of Tamil origin and Ceylonese descent with distant colonial Portuguese roots, while his mother Nellie is an ethnic Eurasian of English and Portuguese descent and was raised in India. They met while Ivan was studying geology in India and they married a year later. Sebastian is the second of four sons. His older brother Ollie was born in India, and his younger brothers Chris and Jeremy were born in Australia after the family migrated there in 1988, when he was six years old. They lived in Melbourne, Victoria, for several years before eventually moving to Adelaide, South Australia, due to Ivan's work as a geologist. As a child Sebastian took violin lessons; he would later learn to play guitar, drums and piano, although he has had no formal training in these other musical instruments. He attended Paradise Community Church, an Assemblies of God church and one of the largest churches in Australia, and he became one of their main worship singers. He also sang with the Paradise Community Church Youth Conference Planetshakers, performing both lead and backup vocals for their 2002 and 2003 conferences and albums. (After winning Australian Idol he recorded on two of their albums, Adore in 2004 and Set Me Free in 2005.) Sebastian attended King's Baptist Grammar School. He then began studies in Medical Radiation at the University of South Australia, but left to pursue a career in music. He taught vocals at Temple Christian College and other high schools while also working as a recording engineer and studying Music Technology at the University of Adelaide's Elder School of Music. In May 2003 Sebastian successfully auditioned for Australian Idol, singing Stevie Wonder's "Ribbon in the Sky". He progressed through the Idol series, establishing a strong fanbase and praise from the judges, who often made reference to his afro hairstyle which became a focal point of his image. He was declared the winner on 19 November 2003, and gained a recording contract with BMG, which later merged with Sony. Following his Idol win Sebastian was required to record his debut album in six days, but despite this time restriction the album included three songs co-written by him. He then travelled to the UK to compete in World Idol. Although he impressed the judges, with several suggesting he could win the competition, he finished seventh. Sebastian's winner's single "Angels Brought Me Here" debuted at number one and was the highest selling single in Australia in 2003, reaching 5× platinum certification. In 2010 it was named the highest selling song of the previous decade, ahead of Anthony Callea's "The Prayer". "Angels Brought Me Here" held the record for being the highest selling single ever released by an Australian act until 2011. Sebastian's debut album Just as I Am was released in December 2003 and also achieved number one. Its first week sales of 163,711 units are the second highest one week sales in Australian chart history, the highest for an Australian act. It eventually reached sales just short of 7× platinum, and is the highest selling album ever released by an Australian Idol contestant. "Angels Brought Me Here" also reached number one in Malaysia, Singapore, the Philippines, Indonesia and New Zealand. Just as I Am reached number three and double platinum certification in New Zealand, with "Angels Brought Me Here" achieving platinum certification there. The second single "All I Need Is You" reached number one and platinum in Australia, and peaked at number five in New Zealand. In early 2004 Sebastian appeared at the Asian MTV Awards, was a guest judge on New Zealand Idol and performed on Indonesian Idol. After a promotional trip to Malaysia in April he travelled to Europe and the US to write for his next album, performing on American Idol while in the US. Beautiful Life, Sebastian's second album, had a more R&B edge to it and included songs he co-wrote with Robin Thicke and Brian McKnight and "Forever with You", a duet with American R&B singer Mýa. The lead single "Out with My Baby" debuted at number one in October 2004, and gained platinum certification. Sebastian performed at the 2004 ARIA Music Awards where he received the award for the Highest Selling Single for "Angels Brought Me Here", and the Channel V Oz Artist of the Year Award. He was also nominated for Highest Selling Album for Just as I Am. Beautiful Life peaked at number two and was also certified platinum. Sebastian embarked on a national tour in November, with a second stage from March to June 2005. Sebastian performed at the 20th Anniversary SAFM Sky Show in Adelaide in front of approximately 150,000 people along with Slinkee Minx, one of the largest open-air concerts held in Australia in 2005. Two further singles were released from the album, "Kryptonite" which peaked at number fifteen, and "Oh Oh" at number eleven. In 2005 Sebastian received awards for Favourite Video, Favourite Music Artist, and Favourite Aussie at the Nickelodeon Kid's Choice Awards, and a MTV Video Music Award for "Out with my Baby". He also received a Highest Selling Album ARIA Award nomination for Beautiful Life, and was named as a state finalist in the Young Australian of the Year Awards. Between May and August 2006, Sebastian appeared as a mentor on the inaugural It Takes Two, in which performers from non-musical fields are teamed with professional singers to perform a duet each week. Sebastian's partner was three-time Australian Olympic swimmer Sarah Ryan and they finished second. During this period Sebastian also recorded his third album Closer to the Sun which was a mix of genres including pop, R&B, soul, pop rock and jazz and mainly co-written with Australian musicians. The lead single "Taller, Stronger, Better" debuted at number three in August 2006, and achieved gold certification. The album peaked at number four and was certified platinum. The second single "Elevator Love" reached number 11 and gold certification. The video featured Jennifer Hawkins as his love interest. Sebastian received an award for most played Urban work for "Oh Oh" at the 2006 APRA Music Awards. "Oh Oh" was also awarded Best Video and Sebastian named Best Male Artist at the Urban Music Awards, and for the second year in succession he received the Fav Aussie award at the Nickelodeon Kids Choice Awards. Closer to the Sun's third single "Cover on My Heart" was released in August 2007, peaking at number thirty two on the ARIA Singles Chart. Closer the Sun was named Best Album at the 2007 Urban Music Awards and Most Popular Album at the Dolly Teen Choice Awards. In early 2007 it had been announced Sebastian would be recording a tribute album of soul classics in Memphis, Tennessee with Stax musicians who played on and wrote some of the original songs. The album was recorded at Ardent Studios, Memphis in August 2007, with Steve Cropper, Donald 'Duck' Dunn, and Steve Potts (a.k.a. The MGs), with Lester Snell on keyboards. Cropper also co-produced the album with Sebastian, which was recorded on analogue tape live in the studio. Sebastian wrote about his time in Memphis in a series of blogs for Australian newspapers, "I started recording four days ago with the band members from Booker T and the MGs. And in the four days, we cut 15 tracks. It's been such a great experience to watch these guys work. I mean, they are mostly in their late 60s and have such a wealth of experience." Cropper later spoke on AllMemphisMusic, an online Memphis radio station, "This kid came into Memphis, and just blew everybody's socks off. [...] he just took us by storm." Shortly after Sebastian's return to Australia it was announced that The MGs would tour Australia with him in early 2008. The Memphis Album debuted at number three in November 2007, and was the seventh highest selling Australian artist album of the year. The critically acclaimed album reached double platinum certification in 2008. The Memphis Flyer, a weekly alternative newspaper serving the Memphis area wrote a series of articles about Sebastian recording with The MGs. AllMemphisMusic, which specialises in playing music originating from Memphis, began playing The Memphis Album songs in late December 2007. They also had two special programs featuring songs from the album and interviews with some of the people involved in recording it. The MGs came to Australia in February 2008 to be Sebastian's backing band for his national tour. He spoke on radio about what it felt like fronting the MGs, "There were so many moments when I just had to take a step back and think 'This is unbelievable'. Like the history that is behind me, and I'm singing these songs. You know they start playing Dock of the Bay, and the guys that played it are on the stage. You know the guy who wrote the song with Otis Redding is playing guitar." Cropper later spoke on AllMemphisMusic, "hearing him singing our music, which was born and raised and produced and recorded in Memphis, Tennessee. [...] It just filled our hearts." One of the Melbourne concerts was filmed for a live DVD/CD titled The Memphis Tour. Sebastian was nominated for a Helpmann Award for Best Performance in an Australian Contemporary Concert for The Memphis Tour, and was awarded two Australian Club Entertainment Awards, best Original Music Performer and Outstanding Club Performer of the Year. The Memphis Album received a nomination for Highest Selling Album at the 2008 ARIA Awards, his third album to be nominated in this ARIA Awards category. He travelled to the US several times after The Memphis Tour to write for his fifth album, spending time with Cropper in Nashville on these trips. In 2008 Sebastian was signed to release an album in the US, and in November he returned to America to work on it. He recorded songs with John Mayer's band, and John Mayer himself played guitar and sang backing vocals on three of the tracks. He moved to New York in early 2009 to prepare for the release of the US album which was a mix of Memphis soul covers and original songs. He performed showcases at the SXSW Music Festival in Austin Texas, and a residency at the Drom in New York. His song "Like It Like That" was chosen as the theme song for the NBC network's summer promotional campaign. The US release was then delayed due to restructuring of Victor Records, but it was later reaffirmed the album would be released in 2010. "Like It Like That", the title track of Sebastian's fifth album, was released in Australia in August 2009 and reached number one. It was the highest selling Australian artist song in 2009, and achieved 4× platinum certification. Like It Like That, an original soul album with all songs written or co-written by Sebastian, was released in October 2009. It reached number six and was certified platinum. "Art of Love", a duet with Jordin Sparks was released as the second single. It peaked at number eight and reached double platinum certification. It also charted at number seven in New Zealand, gaining gold certification there. Two further singles, "All to Myself" and "Never Hold You Down", did not chart in the ARIA top 50. Sebastian toured in Australia during February 2010 and again in June and July. The US album, now identical to the Australian album, was given limited release on the Red Ink label in June 2010, with distribution via iTunes and Barnes & Noble stores. He was chosen as a judge on the 2010 series of Australia's The X-Factor, and to fulfil commitments to X-Factor and also the release of his album in America Sebastian divided his time between Australia and the US during the show. He toured the US West Coast between July and September, including guest performances singing "Art of Love" with Sparks at three of her Battlefield Tour concerts, and also played support for Chicago at a concert in Oregon. Sebastian was nominated for six ARIA Music Awards for Like It Like That. He received nominations for Best Pop Release, Best Male Artist, Most Popular Australian Album and Most Popular Australian Artist, with "Like It Like That" and "Art of Love" receiving nominations for Most Popular Single. In 2010 Sebastian was selected as a judge on the Australian series of The X Factor. It is a talent competition where the judges also mentor the contestants. The contestants are selected by all the judges at the auditions, and the chosen acts are divided into four categories, Boys, Girls, Over 25s and Groups. Each judge is given a category and has to reduce their acts to three. The three acts from each category then compete in the live shows with continuing help from their mentors. Sebastian was given Groups in 2010, and was assisted in choosing his final three acts by Rai Thistlethwayte, lead singer of Thirsty Merc, Snoop Dogg and Usher. Sebastian released a retrospective album titled Twenty Ten in November 2010. The album reached number four on the ARIA Album Chart. It spent twelve weeks in the top ten and was the fifth highest selling Australian artist album of 2010. It was certified double platinum in 2014. It also reached number twenty four on the New Zealand Albums Chart. The album was a two disc release. The first disc had 18 songs from his previous albums and two new tracks, with the second disc containing acoustic versions of ten of the songs. "Who's That Girl" featuring US rapper Eve, was released as the only single. The dance-driven electro R&B song was a departure from Sebastian's previous pop, R&B and soul releases. Eve performed the song with Sebastian on The X Factor Grand Final. "Who's That Girl" reached number one and 5× platinum certification in Australia, and number one and platinum in New Zealand. Lionel Richie and Sebastian performing "All Night Long"
With the release of Twenty Ten Sebastian had completed the terms of his original contract with Sony, but re-signed with them for another long term contract. He supported Boyzone on their 2011 UK tour, and Lionel Richie on his Australian and New Zealand tour. They re-recorded Richie's 1983 single "All Night Long" to raise money for Australian and New Zealand flood and earthquake relief. The track was produced by RedOne. Richie and Sebastian performed the song together at most of the concerts on the Australian leg of the tour. It peaked at number twelve in New Zealand and number twenty six in Australia. Sebastian received the 2011 Australian Club Entertainment Award for best Original Music Performer, and a Mo Award for Rock Performer of the Year. He also won the Highest Selling Single ARIA Award for "Who's That Girl", and received nominations for Single of the Year, Best Pop Release and Most Popular Australian Artist. Sebastian continued as a judge on the 2011 The X Factor. He mentored the Boys and was assisted in choosing his final three by Wynter Gordon and Beyoncé. Reece Mastin who was in his group was the winner. In November 2011 "Don't Worry Be Happy", a pop song Sebastian wrote after encountering an angry motorist in Los Angeles, was released as the lead single of his seventh album Armageddon. It peaked at number five and reached 4× platinum certification. Sebastian spent time in the US in early 2012 working on the album, and "Gold", an uptempo soul track, was released as the second single in May. It peaked at number ten, gaining platinum certification. Sebastian toured nationally during June and July to showcase new songs. In 2012, Sebastian appeared as a judge on The X Factor for a third and final year (until 2015). He was given the Over 25s, and was assisted in selecting his final three by Alicia Keys. His contestant Samantha Jade was the winner. Armageddon's third single "Battle Scars", an R&B ballad featuring a hip hop rap by Lupe Fiasco, was released in August. It debuted at number one, Sebastian's sixth number one single in Australia. He has the most number one singles for an Australian male artist in Australian music history, and is third overall for all Australian acts. Only Kylie Minogue and Delta Goodrem have achieved more. "Battle Scars" was the third-highest selling single in Australia in 2012 and the highest-selling single by an Australian act. It reached 11× platinum in 2019. "Battle Scars" also reached number two and double platinum certification in New Zealand. Fiasco added "Battle Scars" to his fourth album, Food & Liquor II: The Great American Rap Album Pt. 1 in countries other than Australia, and it was released as the fourth single on 28 August 2012. He came to Australia in mid September to promote the single and the release of his album, and he and Sebastian performed "Battle Scars" live for the first time on The X Factor. They also performed the song in America on the Late Show with David Letterman. It was used in the US in the TV promotion for the movie Red Dawn. "Battle Scars" spent 20 weeks on the Billboard Hot 100 chart, peaking at number 71. It also reached number 23 on the Billboard Digital Song Chart and number one on the R&B/Hip-Hop Digital Song Chart. It has been certified platinum in the US for sales of one million. The song also spent 13 weeks in the top ten in Norway, including six weeks at number two, and reached 46 and gold certification in Sweden. Armageddon was released on 12 October 2012. It reached number one in its seventh week and achieved double platinum certification. After only 12 weeks of sales the album was the ninth highest selling album in Australia in 2012, the second highest selling album by an Australian act. Sebastian was nominated for three 2012 ARIA Awards. He received nominations for Best Pop Release and Best Male Artist for "Battle Scars", and "Don't Worry Be Happy" was nominated for Song of the Year. Sebastian and Fiasco performed "Battle Scars" at the Awards. "Battle Scars" was also nominated for an American NAACP Image Award for Outstanding Duo, Group or Collaboration. The fourth single "Get Along", a song about the harm caused by religious, cultural and racial intolerance reached number five and triple platinum certification. The song also reached number nine and gold certification in New Zealand. In early 2013 Fiasco and Sebastian continued the US promotion of "Battle Scars", performing on Late Night with Jimmy Fallon and Conan. From March to June 2013 he toured Australia with the 47-date Get Along Tour. Sebastian won two 2013 ARIA Awards, Best Pop Release for Armageddon, and Best Live Act for the Get Along Tour. He was also nominated for Album of the Year and Best Male Act for Armageddon and Song of the Year for "Get Along". In October 2013 Sebastian released "Like a Drum", the lead single from his eighth studio album. Debuting at number four, it became his 12th top ten single in Australia, and his tenth to reach the top five. It has been certified 4x platinum in Australia. Sebastian opened for Taylor Swift on the Australian leg of her Red Tour. "Like a Drum" was released in the United States, Canada, and Europe in January 2014 through The Cherry Party and RCA Records. The song reached number 20 on the Billboard Dance Club Chart and 49 and platinum certification in Sweden. The second single, "Come Home With Me", reached number 13 on the Aria Singles Chart and platinum certification. The third single, "Mama Ain't Proud" featuring 2 Chainz, peaked at number 17 and reached gold certification. Sebastian received two 2014 ARIA nominations, Best Male Artist for "Come Home With Me" and Song of the Year for "Like a Drum". Sebastian's eighth album, Madness, was released on 21 November 2014 and debuted at number six and was certified gold. The album also reached number 34 in Sweden in 2015. The fourth single "Linger" reached number 17 and platinum certification. Sebastian held an arena tour in Australia in February 2015 to support the album release. "Like a Drum" received 2015 APRA nominations for Pop Work of the Year and Most Played Australian Work. Sebastian was chosen as the Australian entrant in the Eurovision Song Contest 2015, making him the first artist to represent Australia in the competition. He performed the song "Tonight Again", and placed fifth in the competition overall. "Tonight Again" debuted at number 12 in Australia. It also charted at number five in Iceland, 16 in Austria, 22 in Sweden and reached the top 50 of the German and Swiss charts. It achieved gold certification in Sweden. Sebastian toured in Europe in August and September, performing in Sweden, Germany, Norway and The Netherlands. He was nominated for 2015 ARIA Award for Best Male Artist for "Tonight Again". He returned to the judging panel of Australia's The X Factor after a two-year absence. In November 2015 he released "Black & Blue". The song reached number 17, and achieved platinum certification. In January and February 2016 he held a 35 date Australian regional tour. Sebastian received 2016 ARIA Award nominations for Best Male Artist and Best Video for "Black & Blue". In late 2016 Sebastian released two singles, "Candle" which peaked at 59, and "Set in Stone" which reached number 11, his 21st top 20 single in Australia. It has been certified platinum. Sebastian released Part 1 EP in December 2016. It was released digitally on 2 December, and peaked at number 31 on the ARIA Album Chart. The physical cd was released on 16 December. A third single, "Mind On You", did not chart. In March and April 2017 Sebastian toured the Australian eastern states to preview songs from his next album. In September 2017, Sebastian released the single "High On Me" and announced his album Conscious would be released on 3 November 2017. He also announced a November tour of the mainland capital cities and Newcastle. "Keep Me Coming Back" and "Vesuvius" were released as promotional singles from Conscious, ahead of the album release. It was also confirmed "Set in Stone" was also included in the album. "Set in Stone" has been nominated for an ARIA Award for Song of the Year, Sebastian's 28th Aria nomination. "Bloodstone", the second official single peaked at number 59 and was certified platinum, with Conscious debuting at number four, Sebastian's ninth top ten album. On 4 October 2018, Sebastian announced "Before I Go" will be the lead single from his upcoming 9th studio album. The single was released on 2 November. It peaked at number 43 and has been certified gold. On 14th November 2018, Sebastian was announced to be joining The Voice Australia, replacing Joe Jonas as the fourth coach. Sebastian cites a number of musicians as his musical influences, including Sam Cooke, Otis Redding, Donny Hathaway, Stevie Wonder, Chicago, and Boyz II Men. His music has crossed many genres, including pop, R&B, funk, smokey soul, gospel, jazz, pop rock, Memphis soul covers, '60s soul/pop and electro R&B. He has also stated an interest in recording dance and Bollywood albums. While Sebastian's first three albums showed elements of soul, it was The Memphis Album which consolidated his reputation as a soul musician. Reviewers almost unanimously agreed he had captured the spirit and essence of the Memphis soul classics. It was the critical and public reception for The Memphis Album which gave Sebastian the confidence to stay with the soul genre for his fifth album Like It Like That. In an interview with The Age he said he was told early in his career, "If you self-indulge and just do what you're into, you're going to corner your market. Soul music isn't big here." but "the most comfortable I've ever felt in the studio was during The Memphis Album. And the success of that prompted me to make a record like this one. Because I realised that this isn't obscure music." The Daily Telegraph music editor Kathy McCabe said: "Sometimes it takes four records, with a detour into "concepts" covers territory to find where you fit. Sebastian has found his niche with Like It Like That, which expertly balances the line between radio friendly pop and classic soul". Paul Cashmere from Undercover wrote: "By covering the classics on The Memphis Album Guy Sebastian discovered Guy Sebastian. [...] If The Memphis Album was Guy's initiation into becoming a Soul Man then Like It Like That is the graduation." In an interview for the release of his seventh album Armageddon, Sebastian spoke of how much The Memphis Album still influences his music: "I got to work with some people who were instrumental in shaping the careers of artists who heavily influence me. Artists like Otis Redding, Sam & Dave and Sam Cooke. Being entrenched in that sort of environment really caused me to go 'You know what dude. Do what you want to do. Do what comes natural to you'. [...] From that Memphis thing a few years ago it's always going to start with me being true to who I want to be and what I enjoy singing." Sebastian began writing songs before entering Australian Idol. "All I Need Is You", the second single from his debut album Just as I Am was written when he was a teenager, and fine-tuned during his time on Idol. He also wrote gospel songs for his church during his teenage years. One of them, "Adore", was included in their 2004 album Paradise Live: Adore. Sebastian wrote or co-wrote most of the songs on his albums Beautiful Life and Closer to the Sun, and all the tracks on his albums Like It Like That and Armageddon. In an article in The Daily Telegraph, Kathy McCabe said of his songwriting skills, "Sebastian has matured into a genuine hitmaker, his gift with melody so finely-honed he can pretty much punch out a catchy number in his sleep." Jamie Horne wrote in The Border Mail, "The inaugural winner's longevity [...] can be attributed to the fact that he's an accomplished musician and songwriter" and AllMusic reviewer Jon O'Brien said, "it's a testament to his vocal abilities and songwriting skills that, unlike many of his fellow winners, he's remained popular enough to see out his rather ambitious Sony contract [...] a subtle and natural progression with each album, explains why he's managed to survive once the show's publicity machine died down." In 2008 "Receive the Power", a gospel song written by Sebastian and Gary Pinto, was chosen as the official anthem for the Roman Catholic Church's XXIII World Youth Day. "Art of Love", co-written by Adam Reilly, was shortlisted for the APRA Song of the Year in 2010. "All to Myself", written with Carl Dimataga, and "Who's That Girl" were shortlised for the 2011 APRA Song of the Year, with "Who's That Girl" winning the APRA Award for Urban Work of the Year. "Don't Worry Be Happy" was shortlisted for the 2012 APRA Song of the Year. "Battle Scars" won the R&B/Hip category in the 2013 International Songwriting Competition. "Get Along" was a finalist in the Pop/Top 40 category, and was awarded an honourable mention. "Get Along" was also one of the final five nominees for the 2013 APRA Song of the Year. "Set in Stone was shortlisted for the 2017 APRA Song of the Year, and "Black & Blue" was nominated for Pop Work of the Year. Sebastian has a worldwide, long term publishing agreement with Universal Music Publishing. He has written songs for other artists, including co-writing "Dot Com", a song performed by Usher on Rhythm City Volume One: Caught Up. He also has an interest in production and co-produced The Memphis Album with Steve Cropper. He has his own recording studio, Cooper Lane Studio, where he produces and engineers some of his music, and which is also used by other musicians. He produced a song called "Think of Me" for 2009 Australian Idol Stan Walker's debut album, as well as playing most of the musical instruments on the track. World Youth Day, July 2008: "Receive the Power" a song written by Sebastian and Gary Pinto was chosen as the official anthem for the Roman Catholic Church's XXIII World Youth Day (WYD08) held in Sydney in 2008. The song also features the vocals of Paulini Curuenavuli. "Receive the Power" was released in English and also an international version with the chorus in English and verses in Italian, Spanish and French. It was used extensively throughout the six days of World Youth Day in July 2008, and also in the television coverage which went around the world. Sebastian and Curuenavuli performed both the English and International versions at the final Mass at Randwick Race Course on 20 July which was attended by 400,000 people. They also performed "Receive the Power" at the Pope's Farewell. Olivia Newton-John & Friends Concert, September 2008: This concert was held at the State Theatre in Sydney to raise funds for Newton-John's Cancer and Wellness Centre Appeal. Sebastian was chosen to sing a duet with Newton-John. They sang her iconic hit from Grease, "Summer Nights". Oscar Haven – Los Angeles, February 2009: Sebastian was a headline act at an Oscar Haven party hosted by Stardust Pictures and Jamie Kennedy. Haven is held during Oscar week and invitees include Film Academy nominees as well as actors and insiders from film, television and music industries. 9th Annual NON-COMMvention – Philadelphia, May 2009: Sebastian performed with Steve Cropper and David Ryan Harris at the 9th Annual NON-COMMvention. The event is the premier annual conference for North America's non-commercial Triple A radio. Oprah Winfrey's official welcome to Sydney and wrap up party, December 2010: Sebastian was the guest performer at an event at Sydney's Botanical Gardens to officially welcome Oprah Winfrey and her American audience members to Australia. Winfrey was in Australia to record two of her shows at the Sydney Opera House. Sebastian sang for Winfrey a second time when she requested he perform at her private crew wrap-up party. G'Day USA, January 2011 and 2012: G'Day USA is an annual two-week program designed to showcase Australian business capabilities, and is the largest foreign country promotion held in the US. Sebastian and the Qantas Choir were the entertainers at the 2011 Black Tie Gala in Los Angeles. Sebastian performed his own songs and also a medley of Bee Gees songs prior to Barry Gibb being honoured for excellence in Music at the event. During G'Day USA 2012 he performed at the American Australian Association Black Tie Gala in New York and the Australian American Chamber of Commerce Gala in Houston Texas. Grammy week – Los Angeles, February 2011: During Grammy week each year there are many events leading up to the Grammy Awards night. Sebastian was invited to perform at two of these events in 2011. He performed at The Black Eyed Peas Peapod Benefit Concert which was attended by musicians, DJ's, philanthropists, Hollywood celebrities and industry executives. He also performed at the Roots Pre Grammy Jam Session. The Roots are a Grammy Award winning hip hop and neo soul American band. During Grammy week they hold a jam session and invite other musicians to perform with them. Their 2011 jam session was hosted by Jimmy Fallon and other performers included Sara Bareilles, Lalah Hathaway, Booker T. Jones and Chaka Khan. CHOGM 2011 Opening Ceremony – Perth, Western Australia October 2011: Sebastian performed "Agents of Change", a song written by him especially for the event, at the opening ceremony of the biannual Commonwealth Heads of Government Meeting (CHOGM). In attendance at the ceremony were Queen Elizabeth II, Prime Minister Julia Gillard, the Secretary-General of the Commonwealth and heads of government from all 53 Commonwealth nations. The GRAMMY Foundation's 15th Annual Music Preservation Project – Los Angeles, February 2013: Held each year during Grammy Week, in 2013 the event was "Play It Forward: A Celebration Of Music's Evolution And Influencers". It explored the history of legendary influencers in music, the music they inspired and their impact on the American cultural landscape. Lupe Fiasco and Sebastian were chosen to perform "Battle Scars" as the finale of the concert. Other performers included Dionne Warwick, LeAnn Rimes and Ed Sheeran. In late 2007 after eight years of courtship Sebastian and girlfriend Jules Egan became engaged. They were married in Manly, Sydney on 17 May 2008. They have two sons, Hudson (born 2012) and Archer (born 2014). Throughout his career Sebastian has had a strong commitment to charity. He has been an ambassador for the Ronald McDonald House charities, and is currently an ambassador for the Australian Red Cross and Golden Stave, which is the Australian music and entertainment industry's charity fund raising organisation. He is also an ambassador for World Vision Australia, and in 2005 he travelled to Uganda to film a World Vision documentary "An Idol in Africa" for a Network Ten television special. Sebastian has continued his work with World Vision, supporting the Child Rescue program and the 40 Hour Famine. He has also been involved in the Make Poverty History coalition of which World Vision is a part. In 2008 he was presented with the Extreme Inspiration Award at the Dolly Teen Choice Awards for his continuing support of World Vision. Sebastian is also strongly committed to the Sony Foundation, which raises funds to help young Australians facing homelessness, severe illness, disability and isolation. In 2009 the Sony CEO Denis Handlin said: "Every time I've asked Guy to get involved with the Sony Foundation through charity he's been completely proactive. Guy's been such a great ambassador for that, and a lot of it is under the radar but it just tells you so much about what a decent human being he is." Sebastian contributes to many other charitable projects. In 2005 he was the guest performer on the annual Indian Pacific Outback Christmas Journey which raises money for the Royal Flying Doctor's Service. In 2008 he performed a series of 11 concerts with the Australian Army Band to raise funds for Legacy. Legacy is a voluntary organisation which supports the families of deceased veterans. The concerts were held in theatre venues around Australia and the funds raised went to the local Legacy branch in the area each concert was held. Sebastian regularly performs at other fundraising events including Brisbane radio station B105's Christmas appeal for the Royal Children's Hospital, and Perth's annual Telethon. He also donates his time to annual Christmas carol events such as Carols in the Domain, Vision Australia's Carols by Candlelight, and Brisbane's Carols in the City. His songs are frequently featured on charity CDs including the Salvation Army Christmas fundraising CDs, The Spirit of Christmas albums. Sebastian also makes unofficial appearances at hospitals several times a year. In 2013, Guy together with his wife Jules formed The Sebastian Foundation. Both were raised with a strong affinity to charity and at the time of having their first child and making their own family, wanted to create an organisation through which they could help other families who were a little less fortunate than theirs. Based on an understanding of what a positive impact a strong family unit can have on both individuals and community, The Sebastian Foundation looks to provide a little bit of the warmth and benefit of family where it might be missing through serious illness, underprivilege or domestic violence. Project based, the Foundation seeks to help where the need is – they have renovated kitchens, gardens, and living areas in women's refuges, provided sleeper beds to hospitals to allow families to stay together through treatment and countless other ways to make a difference in some of Australia's most vulnerable lives. The Foundation has been working alongside the NSW Minister for Social Housing on a proposal that will revolutionise the way women fleeing domestic violence seek shelter which has the potential to impact generations to come, and a mentoring program to help young women who have been through the shelter system put their best foot forward. Funds are raised for the Foundation from corporate sponsors and through the annual MYER Carols in the City performance in Sydney. Sebastian has been nominated for numerous awards during his career, winning many of them. These awards and nominations include ARIA Awards, ARIA No. 1 Chart Awards, APRA Awards, Australian Club Entertainment Awards, Nickelodeon Kids Choice Awards, Urban Music Awards, and a Channel V Artist of the Year Award. ^ "FMQB: Radio Industry News, Music Industry Updates, Nielsen Ratings, Music News and more". Archived from the original on 3 April 2014. Retrieved 3 April 2014. ^ "RCA Artists: Guy Sebastian". RCA Records. Retrieved 3 April 2014. ^ a b Moran, Jonathon (2 May 2015). Chris Isaak and James Blunt: Meet the new X Factor guys. Perthnow. Archived from the original on 3 May 2015. ^ a b Idato, Michael (24 March 2015).Eurovision 2015: Sweden's Mans Zelmerlow wins; Australia's Guy Sebastian fifth. Sydney Morning Herald. Retrieved 6 December 2015. ^ a b c d e f g h i j k l m n o p q r s t u v w x y z aa ab Girly Sebastian in the Australian Charts. australian-charts.com. Retrieved 21 January 2012. ^ a b c Album and Single Accreditations 1997–2012. Australian Recording Industry Association. Retrieved 5 March 2009. ^ a b Ryan, Gavin (19 August 2012). Guy Sebastian Equals Abba For Number 1 Hits In Australia. Noise11. Archived from the original on 19 August 2012. ^ a b ARIA Charts – Accreditations – 2012 Singles. Australian Recording Industry Association (ARIA). Retrieved 15 June 2012. ^ a b c d e f g h i j ARIA Accreditations – 2019 Singles. Australian Recording Industry Association (ARIA). Retrieved 30 March 2019. ^ a b c ARIA's End Of Decade Charts* (PDF). Australian Recording Industry Association. 7 January 2010. Archived from the original on 21 January 2012. ^ a b Guy Sebastian and Lupe Fiasco - Battle Scars. aCharts.US. Retrieved 29 January 2013. ^ a b Battle Scars Norway. norwegiancharts.com. Hung Medien. Retrieved 3 January 2013. ^ a b c d e f g Guy Sebastian in the NZ charts. Charts.org.nz. Retrieved on 17 September 2012. ^ a b RIANZ Archived Charts 18 January 2004.Recording Industry Association of New Zealand (RIANZ). Retrieved 4 October 2013. ^ a b c Latest Gold/Platinum Singles. RadioScope New Zealand. Archived from the original on 24 July 2011. Retrieved 15 January 2012. ^ a b Guy Sebastian - Tonight Again. acharts.us. Retrieved 30 May 2015. ^ a b Guy Sebastian – Tonight Again, Chartlist week 23, 2015. Tonlist. Archived from the original on 9 June 2015. ^ a b c d e f g h ARIA Awards History by Artist. Australian Recording Industry Association. Archived from the original on 30 November 2012. ^ a b ARIA Nominations. Australian Recording Industry Association. 28 September 2010. Archived from the original on 21 January 2012. ^ a b ARIA Award nominees announced for 2011. thevine.com.au. 12 October 2011. Archived from the original on 30 November 2012. ^ a b Winners of the 2011 ARIA Awards. The Sydney Morning Herald. 27 November 2011. Archived from the original on 30 November 2012. ^ a b Smith, Sarah (6 October 2014). Chet Faker and Violent Soho lead 2014 ARIA nominations. Faster Louder. Archived from the original on 7 October 2014. ^ a b Pope personally thanks WYD08 Volunteers. Catholic News Agency. 20 July 2008. Archived from the original on 21 January 2012. ^ a b Exclusive: Guy Sebastian sings at Oprah's private party. Today Network. The Dirt. 16 December 2010. Archived from the original on 21 January 2012. ^ a b Iggulden, Tom (28 October 2011). Queen welcomes 54 countries to CHOGM. ABC Lateline. Archived from the original on 21 January 2012. ^ a b c The X Factor Australia: Guy Sebastian. Yahoo!7 tv. Archived from the original on 21 January 2012. ^ a b Cronin, Seanna (5 October 2016).Flume leads nominations for 30th annual ARIA Awards. Retrieved 5 October 2016. ^ a b c Cheah, Jason (22 December 2003). Nice guys do win. thestar.com. Archived from the original on 21 January 2012. ^ Guy Sebastian: "I believe everything has a season.". cqbiblestudy.org. Archived from the original on 21 January 2012. ^ Guy wows World Idol judges. The Age. 27 December 2003. Archived from the original on 21 January 2012. ^ ARIA Charts Top 100 Singles 2003. Australian Recording Industry Association. Archived from the original on 23 January 2012. ^ Cashmere, Paul (29 January 2005). Anthony Callea Premature Sales Announcement. undercover.com.au. Archived from the original on 31 January 2004. Retrieved 4 February 2012. ^ Cashmere, Paul (27 December 2006). Damien Leith Has Biggest Seller Of The Year. Undercover.com.au. Archived from the original Archived 30 August 2007 at the Wayback Machine on 21 January 2012. ^ Adams, Cameron (29 December 2009). Susan Boyle's album smashes sales records. Herald Sun. Archived from the original on 21 January 2012. ^ Quinn, Karl (21 November 2004). Everyone's A Winner. The Age. Archived from the original on 21 January 2012. ^ Sams, Christine (8 November 2010). How I beat bullies of rock'n'roll. The Sydney Morning Herald. Archived from the original on 25 January 2012. ^ a b c d Guy Sebastian biography. Guy Sebastian official site. Archived from the original on 21 January 2012. ^ a b c Beautiful Life & Guy Facts. opensubscriber.com. Archived from the original on 19 January 2012. ^ RIANZ Archived Charts NZ Top 40 Singles 11 January 2004.Recording Industry Association of New Zealand (RIANZ). Retrieved 4 October 2013. ^ a b ARIA Charts – Accreditations – 2004 Singles. Australian Recording Industry Association (ARIA). Archived from the original on 25 January 2012. ^ a b Canak, Danny (15 November 2004). Aria Awards 2004. Musicdish. Archived from the original on 21 January 2012. ^ ARIA Charts – Accreditations – 2004 Albums. Australian Recording Industry Association. Retrieved 28 August 2009. ^ a b Guy & Paulini Announce More Shows For The Beautiful Life Tour. Guy Sebastian official website. 6 April 2005. Archived from the original on 21 January 2012. ^ a b Kids' choice – Guy. The Age. 21 September 2005. Archived from the original on 21 January 2012. ^ Halliwell, Elle & Anderson, Juliet. MTV Australian Video Music Awards for 2005. Mediasearch. Archived from the original on 21 January 2012. ^ MSA Member NSW Finalist for Young Australian of the Year. marssociety.org.au. 1 December 2005. Archived from the original on 21 January 2012. ^ IT TAKES TWO. 7 Perth. Archived from the original on 22 January 2012. ^ a b ARIA Charts – Accreditations – 2007 Singles. Australian Recording Industry Association. Retrieved 27 February 2009. ^ ARIA Charts – Accreditations – 2006 Albums. Australian Recording Industry Association. Retrieved 28 August 2009. ^ ACA Preview of Video of Elevator Love with Jennifer Hawkins. Myspace Videos. Archived from the original on 21 January 2012. ^ Pascuzzi, Carmine. 2006 APRA Music Awards. Mediasearch. Archived from the original on 21 January 2012. ^ a b Sebastian, MacRae get gongs at Urban awards. The Sydney Morning Herald. 21 July 2006. Archived from the original on 21 January 2012. ^ Bonawitz, Amy (11 October 2006). Bindi & Terri Attend Kids Choice Awards. CBS News. Archived from the original on 21 January 2012. ^ a b Lizza (17 August 2007). 2007 Urban Music Awards at Luna Park, Sydney. inthemix. Archived from the original on 21 January 2012. ^ Dolly Teen Choice Awards: Winners 07. servinghistory.com. Archived from the original on 21 January 2012. ^ Curry Weber Studio Engineer talks about the Memphis Album. Myspace Videos. Archived from the original on 21 January 2012. ^ Sebastian, Guy (29 August 2007). Guy's Memphis Diary – Week 4 Sunday Herald Sun. Archived from the original on 21 January 2012. ^ Steve Cropper talks about Guy Sebastian and The Memphis Album. MySpace Videos. Archived from the original on 21 January 2012. ^ Guy Sebastian Announces 2008 "Memphis Tour"!. Guy Sebastian official website. 6 November 2007. Archived from the original on 21 January 2012. ^ ARIA End Of Year Charts – Top 50 Australian Artist Albums 2007. Australian Recording Industry Association. Archived from the original on 23 January 2012. ^ a b The Memphis Album Reviews Archived 26 January 2012 at WebCite. Blogspot.com. Retrieved 25 June 2009. ^ ARIA Charts – Accreditations – 2008 Albums. Australian Recording Industry Association. Retrieved 28 August 2009. ^ Branston, John (22 November 2007). Guy Sebastian's Memphis Album Is Actually Good. The Memphis Flyer. Archived from the original on 21 January 2012. ^ Who is this "Guy" Sebastian?. AllMemphisMusic. 23 April 2006. Archived from the original on 21 January 2012. ^ Stuart Bocking 2UE interviews Guy Sebastian about Steve Cropper. YouTube. 27 May 2012. Retrieved 17 December 2015. ^ Steve Cropper talks about Guy Sebastian and The Memphis Album MySpace Videos. Retrieved 23 January 2015. ^ Guy's New DVD 'The Memphis Tour' Out Saturday. Guy Sebastian official website. 29 April 2008. Archived from the original on 21 January 2012. ^ 2008 Helpman Award Nominations. Helpman Awards. Archived from the original on 21 January 2012. ^ a b 11th Australian Club Entertainment Awards Archived 3 March 2011 at the Wayback Machine. ACE Awards. Retrieved 27 February 2009. ^ Cashmere, Paul (21 April 2008). Guy Sebastian Is Hanging With The Croppers. undercover.com.au. Archived from the original Archived 22 September 2008 at the Wayback Machine on 21 January 2012. ^ Guy Sebastian 'could not stop staring' at Nicole Kidman. news.com.au. 1 July 2008. Archived from the original Archived 8 August 2008 at the Wayback Machine on 21 January 2012. ^ Dennehy, Luke (30 November 2008). Guy sees future in Memphis. Herald Sun. Archived from the original on 21 January 2012. ^ Reines, Ros (15 February 2009). Guy targets the States. The Daily Telegraph. Archived from the original on 21 January 2012. ^ Cashmere, Paul (20 March 2009). Guy Sebastian Wins The Tough SXSW Crowd. Undercover.com.au. Archived from the original Archived 21 May 2009 at the Wayback Machine on 21 January 2012. ^ Nanton, Nick Texas and Australia Collide!!…???. D&N Dicks $ Nanton P.A. Archived from the original on 21 January 2012. ^ Guy Sebastian at DROM. Socially Superlative. Archived from the original on 21 January 2012. ^ NBC Network Summer Campaign featuring Guy Sebastian theme. Myspace Video. Archived from the original on 21 January 2012. ^ Guy Sebastian's hit song will be used for US TV promotion. The Daily Telegraph, 13 May 2009. Archived from the original on 21 January 2012. ^ Moran, Jonathon (19 December 2009). Carnival for the Danimals, US glitch for Guy. The Sunday Telegraph. Archived from the original on 21 January 2012. ^ ARIA Charts Top 50 Australian Artist Singles 2009. Australian Recording Industry Association. Archived from the original on 23 January 2012. ^ ARIA Charts – Accreditations – 2010 Albums. Australian Recording Industry Association. Retrieved 8 June 2010. ^ Guy Sebastian and Jordin Sparks record duet. Take 40. 1 October 2009. Retrieved 12 October 2009. ^ Newswrap. auspOp. 29 January 2010. Archived from the original on 21 January 2012. ^ Guy Single #4. auspOp. 27 May 2010. Archived from the original on 21 January 2012. ^ a b Like It Like That Tour For 2010. Guy Sebastian official website. Retrieved 9 September 2009. Archived from the original on 21 January 2012. ^ a b The Bring Yourself Tour!. Guy Sebastian official website. 11 May 2010. Archived from the original on 21 January 2012. ^ Like It Like That Barnes & Noble Exclusive. Barnes & Noble. Archived from the original on 28 January 2012. ^ Dennehy, Luke (30 May 2010). X-Factor to have a nice guy judge. Sunday Herald Sun. 30 May 2010. Archived from the original on 21 January 2012. ^ a b Guy Sebastian Releases Debut U.S. Album, Tours West Coast. popdirt.com. Archived from the original on 21 January 2012. 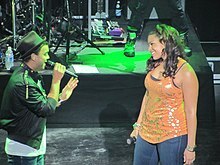 ^ Jordin Sparks and Guy Sebastian sing ‘Art of Love’ Nokia Theater, LA.mjsbigblog.com. 10 July 2010. Archived from the original on 21 January 2012. ^ Guy Sebastian announces more US tour dates.antimusic.com. 4 August 2010. Archived from the original on 21 January 2012. ^ Byrne, Fiona (8 September 2010). Superstars join the X Factor cull. Herald Sun. Archived from the original on 22 January 2012. ^ Twenty Ten in the Australian Charts. australian-charts.com. Archived from the original on 29 January 2012. ^ Top Australian Artist Albums 2010. Australian Recording Industry Association. Archived from the original on 23 January 2012. ^ McCabe, Kathy (22 November 2010). One very suave Guy Sebastian. The Daily Telegraph. Archived from the original on 21 January 2012. ^ Sebastian re-signs with Sony. The Music Network. 23 November 2010. Archived from the original on 21 January 2012. ^ a b Lionel Richie and Guy Sebastian to Play A Day on the Green. Undercover. Archived from the original on 21 January 2012. ^ a b Boyzone Brother Tour support announcement. Boyzonebrotheralbum.com. 7 February 2011. Archived from the original on 21 January 2012. ^ Adams, Cameron (26 February 2011). Lionel Richie and Guy Sebastian have teamed up to record a charity single for earthquake relief. The Daily Telegraph, Sydney. Archived from the original on 21 January 2012. 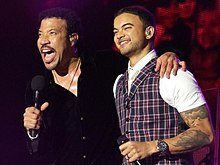 ^ Lionel Richie and Guy Sebastian release duet of All Night Long for Queensland flood + Christchurch earthquake appeals. Mushroom Group Promotions. Archived from the original on 21 January 2012. ^ 2011 Mo Award Winners Mo Awards Inc. Archived from the original on 21 January 2012. ^ Casamento, Jo (21 August 2011). No Fallen Idol. The Sydney Morning Herald. Archived from the original on 22 January 2012. ^ McCabe, Kathy (8 November 2011). Guy Sebastian takes a big dip for the sake of art. Herald Sun. Archived from the original on 21 January 2012. ^ a b TOURING : Guy Sebastian. auspOp. 5 February 2012. Archived from the original on 5 February 2012. ^ Samantha Jade wins X Factor. news.com.au. 21 November 2012. Archived from the original on 21 November 2012. ^ Battle Scars featuring Lupe Fiasco preview Archived 4 April 2013 at WebCite. Guy Sebastian official site. Retrieved 2 August 2012. ^ Ryan, Gavin (25 December 2010). ARIA Chartifacts 27-December-2010. Australian-charts.com. Archived from the original on 21 January 2012. ^ Official New Zealand Music Chart – 26 November 2012. Recording Industry Association New Zealand (RIANZ). Archived from the original on 25 November 2012. ^ US iTunes preview Food & Liquor II: The Great American Rap Album Pt. 1. iTunes. Retrieved 28 September 2012. ^ James, Jessie (21 August 2012). Guy Sebastian Lupe Fiasco Battle Scars. Stupid Dope. Archived from the original on 21 August 2012. ^ Video: Lupe Fiasco & Guy Sebastian Perform "Battle Scars" On "The X Factor Australia". KillerHipHop.com. 18 September 2012. Archived from the original on 19 September 2012. ^ Reid, Poppy (18 September 2012). Guy Sebastian to perform on Letterman. The Music Network. 18 September 2012. Archived from the original on 19 September 2012. ^ Lupe Fiasco & Guy Sebastian – Battle Scars – David Letterman 9-27-12. YouTube. 28 September 2012. Retrieved 28 September 2012. ^ Battle Scars featured in Red Dawn TV Spot. LupEnd. 29 October 2012. Archived from the original on 4 November 2012. ^ R&B/Hip-hop Digital Song Chart 15 September 2012. Billboard.biz. Archived from the original on 13 September 2012. ^ Adams, Cameron (11 September 2012). Guy Sebastian's ARIA number one song Battle Scars with Lupe Fiasco hits 73 on the US Billboard Hot 100. news.com.au. Archived from the original on 29 January 2013. ^ "Sverige Toplistan: Sök" (To retrieve the certification, enter "Guy Sebastian" in the upper right box "Sök", and then click on "Visa" on Battle Scars) (in Swedish). Sverigetopplistan. Retrieved 16 August 2014. ^ 2012 Winners announced. Australian Recording Industry Association. 29 November 2012. Archived from the original on 29 November 2012. ^ Official NZ Music Chart 29 July 2013. Recording Industry Association of New Zealand (RIANZ). Archived from the original on 27 July 2013. ^ Lupe Fiasco x Guy Sebastian Perform "Battle Scars" on Jimmy Fallon. thelupendblog. 3 January 2013. Archived from the original on 3 January 2013. ^ a b Get Along Tour 2013. Guy Sebastian official site. Archived from the original on 4 April 2013. ^ a b Zuel, Bernard (2 December 2013). No Idol threat as Guy Sebastian and Jessica Mauboy beat curse at ARIAs. Sydney Morning Herald. Archived from the original  on 2 December 2013. ^ 27th ARIA Award Nominations. Australian Recording Industry Association. 15 October 2013. Archived from the original on 15 October 2013. ^ a b Adams, Cameron (16 May 2013). Guy Sebastian will open for Taylor Swift on her stadium tour of Australia. news.com.au. Archived from the original on 27 May 2013. ^ "Guy Sebastian's Infectious EDM Adventure "Like A Drum" Gets A US Release". www.idolator.com. ^ "Guy Sebastian Chart history". Billboard. Nielsen Business Media, Inc. 30 November 2013. Retrieved 3 December 2014. ^ "Sverige Toplistan: Sök" (To retrieve the certification, enter "Guy Sebastian" in the upper right box "Sök", and then click on "Visa" on Like A Drum) (in Swedish). Sverigetopplistan. Retrieved 13 October 2013. ^ Guy Sebastian-Madness. swedishcharts.com. Hung Medien. Retrieved 9 June 2015. ^ a b McCabe, Kathy (7 August 2014). Guy Sebastian to play Australian arenas on Madness tour 2015. news.com.au. Archived from the original  on 16 August 2014. ^ .Peer-Voted APRA Music Awards Name 2015 Nominees. themusic.com.au. 26 February 2015. Archived from the original on 26 February 2015. ^ Guy Sebastian - Tonight Again. AustrianCharts.at. Retrieved 4 June 2015. ^ "Sverige Toplistan: Sök" (To retrieve the certification, enter "Guy Sebastian" in the upper right box "Sök", and then click on "Visa" on Tonight Again) (in Swedish). Sverigetopplistan. Retrieved 29 September 2015. ^ a b Gallagher, Robyn (11 August 2015).Guy Sebastian Announces Madness European Tour. wiwiBlogs.com. Archived from the original on 17 December 2015. ^ Baroni, Nastassia (7 October 2015).Courtney Barnett, Hermitude, Tame Impala Lead 2015 ARIA Award Nominations. musicfeeds.com.au. Archived from the original on 7 October 2015. ^ a b .Cashmere, Paul. (12 November 2015).Guy Sebastian to Head Out On Extensive Australian Tour in 2016. Noise11. Archived from the original on 17 November 2015. ^ ARIA Albums Chart. ARIA Charts. Retrieved 10 December 2016. ^ Ryan Gavin (16 December 2016).New Music Releases For 16 December 2016.Noise11 . Retrieved 16 December 2016. ^ "@guysebastian on Instagram: "Surprise! I have a new single coming your way on November 2nd. Pre-save is available from tomorrow. #BeforeIGo 🏃🏽"". Instagram. Retrieved 15 October 2018. ^ Guy Sebastian: From 'Australian Idol' to 'X Factor'. The Celebrity Cafe. 23 August 2010. Archived from the original on 21 January 2012. ^ Undercover interviews Guy Sebastian. uctv.com.fm. Archived from the original on 21 January 2012. ^ Like him like that. The Age. 18 October 2009. Archived from the original on 21 January 2012. ^ McCabe, Kathy. (30 October 2009). Like It Like That review. blogspot.com. (Source: The Daily Telegraph). Archived from the original on 21 January 2012. ^ Cashmere, Paul (22 October 2009). Guy Sebastian Earns His Soul Man Stripes. undercover.com.au. Archived from the original on 22 October 2009. ^ Guy Sebastian Interview - Armageddon. YouTube. 28 October 2012. Retrieved on 15 December 2014. ^ Paradise Live: Adore CD Track Listing. cylist.com. Archived from the original on 22 January 2012. ^ McCabe, Kathy (28 December 2010). Songs you can't get out of your head. The Daily Telegraph. Archived from the original on 22 January 2012. ^ Horne, Jamie (24 November 2010). Guy Sebastian – Twenty Ten (Sony). The Border Mail. Archived from the original on 29 January 2012. ^ O'Brien, Jon. Twenty Ten: Greatest Hits. allmusic.com. Archived from the original on 29 January 2012. ^ a b Australian Idol Wrote World Youth Day Anthem. famvin.org. 17 May 2007. Archived from the original on 21 January 2012. ^ Voting Now Open For APRA’s ‘Song Of The Year’ Award. musicfeeds.com.au. 18 March 2010. Archived from the original on 21 January 2012. ^ Treuen, Jason (24 March 2011). APRA reveals Song of the Year contenders. The Music Network. Archived from the original on 21 January 2012. ^ Kelton, Sam (22 June 2011). Our Guy, his girl crowned the best. Adelaide Now. Archived from the original on 21 January 2012. ^ Australian Song of the Year finalists announced. V Music. Archived from the original on 22 March 2012. ^ Finalists. International Songwriting Competition 2013. Archived from the original on 28 February 2013. ^ International Songwriting Competition Winners. International Songwriting Competition. Archived from the original on 30 April 2013. ^ Adams, Cameron (23 May 2013). Tame Impala and Guy Sebastian vie for APRA Song of the Year honour. Herald Sun. 23 May 2013. Archived from the original on 23 May 2013. ^ .2017 APRA Music Award Nominees Announced. APRA AMCOS. 15 March 2017. Archived from the original on 17 March 2013. ^ .A.B. Original and Flume lead 2017 APRA Song of the Year Top 20. APRA AMCOS. January 2017. Archived from the original on 17 March 2013. ^ Publisher Headlines. Apra-amcos.com.au. December 2009. Archived from the original on 25 May 2010. ^ Browne, Sally (23 June 2012). Guy Sebastian is just an ordinary guy. Courier Mail. Archived from the original on 9 October 2012. ^ Usher Dot.com lyrics. songlyrics.com. Retrieved 18 October 2012. ^ Stward, Andy (17 March 2010). Feature – Oh my god. It's Guy Sebastian. Audio Technology Magazine, issue 73. Archived from the original on 31 January 2012. ^ Adams, Cameron (10 December 2009). Australian Idol's Stan Walker's debut album. Herald Sun. Archived from the original on 22 January 2012. ^ Receive the Power WYD08 Theme Song Archived 29 December 2012 at Archive.today. Myspace Videos. Retrieved 20 June 2009. ^ 400,000 Faithful for World Youth Day Final Mass. Catholic Online. 20 July 2008. Archived from the original on 22 January 2012. ^ Olivia Newton John's the one Guy Sebastian wants. The Daily Telegraph. 1 October 2008. Archived from the original on 22 January 2012. ^ Davalos, Adriana. Haven Pre-Oscars 2009 Gift House Review. lasplash.com. Archived from the original on 22 January 2012. ^ WorldCharms Participates in the Oscars Week Haven Swag Event. 24-7pressrelease.com. 13 February 2009. Archived from the original on 22 January 2012. ^ The Derek Trucks Band and Guy Sebastian featuring Steve Cropper Played XPN's at Noon. wxpn.org. 29 May 2009. Archived from the original on 22 January 2012. ^ Radio video #33 – The 2009 NonCOMMvention. wxpn.org. 8 June 2009. Archived from the original on 22 January 2012. ^ Adams, Cameron (17 February 2010). Delta Goodrem strips things back to basics for next album. Courier Mail. Archived from the original on 22 January 2012. ^ Sydney's All Star Tribute to Michael Jackson's 'This Is It'! Archived 13 October 2013 at the Wayback Machine. Take40. 3 March 2010. Retrieved 11 March 2010. ^ Byrnes, Holly (13 December 2010). True blue Oprah keeps it real with backyard barbecue and VB. news.com.au. Archived from the original on 3 February 2012. ^ Excerpt from Network 10 News coverage on Oprah's Australian visit. YouTube. Retrieved 2 January 2011. ^ Prior, David (24 December 2010). Guy Sebastian on Oprah's charms. 2UE Fairfax Media. Archived from the original on 3 February 2012. ^ G'Day USA promotes Australia. Get Farming Australia. 14 January 2011. Archived from the original on 22 January 2012. ^ Donna Demaio says G'Day from LA. 3aw.com.au. 23 January 2011. Archived from the original on 22 January 2012. ^ Black Tie Gala New York.thesearchengine.net. Archived from the original on 22 January 2012. ^ Join us in celebrating the dramatic and diverse wonders of this amazing Land Down Under. aacc-houston.org. Archived from the original on 25 January 2012. ^ Oh What a week grammy.com. 4 February 2011. Archived from the original on 31 January 2012. ^ The Black Eyed Peas 7th Annual Peapod Benefit Concert Gave Everyone "The Time Of Their Life". cmpr.net. Archived from the original on 22 January 2012. ^ Marino, Kelly (13 February 2011). Roots Host Genre-Spanning, Star-Studded Pre-Grammy Jam Session vh1.com. Archived from the original on 22 January 2012. ^ Guy idolises his new wife. Sunday Herald Sun. 18 May 2008. Archived from the original on 22 January 2012. ^ Guy Sebastian and wife Jules expecting second child. ninemsn. Archived from the original on 8 November 2013. ^ Hull, Christian (19 April 2014).Guy Sebastian Welcomes a Baby Boy!. safm.com.au. Archived from the original on 19 April 2014. ^ The Golden Stave Hall of Fame Dinner 2008. Golden Stave. Archived from the original on 22 January 2012. ^ Sams, Christine (19 September 2005). The 'fro's African education. The Sun-Herald. Archived from the original on 22 January 2012. ^ World Vision News: Guy Sebastian. World Vision Australia. February 2008. Archived from the original on 22 January 2012. ^ DOLLY Teen Choice Awards – the winners!. ninemsn. 14 August 2008. Archived from the original Archived 31 January 2009 at the Wayback Machine on 22 January 2012. ^ Sony Foundation. What we do. Sonyfoundation.corg.au. Archived from the original on 22 January 2012. ^ Sony Proved Why It's An Industry Leader. novafm.com.au. Archived from the original on 22 January 2012. ^ The 'Fro Makes Tracks. Guy Sebastian official website. Archived from the original on 22 January 2012. ^ a b Cashmere, Paul (18 September 2008). Guy Sebastian Joins The Army Tomorrow. Undercover.com.au. Archived from the original Archived 21 October 2009 at the Wayback Machine on 22 January 2012. ^ Legacy. Legacy Australia. Retrieved 19 June 2010. ^ Quagliata, Chris(2 December 2008). Idol Guy performs in Townsville for worthy cause. Townsville Bulletin. Archived from the original on 22 January 2012. ^ Guy Sebastian working wonders for sick kids. workingwonders.com.au. 18 December 2009. Archived from the original on 22 January 2012. ^ Perth telethon raises 6.4 million. mediaspy.org. Archived from the original on 22 January 2012. ^ Australia's Biggest Names. carolsinthedomain.com. Archived from the original on 22 January 2012. ^ A Proud History. visionaustralia.org. Archived from the original on 22 January 2012. ^ Feeney, Katherine (4 December 2008). Carols in the City. brisbanetimes.com.au. Archived from the original on 22 January 2012. ^ The Spirit Of Christmas 2006. Guy Sebastian official website. 16 November 2006. Archived from the original on 22 January 2012. ^ Myer Continues To Share The Spirit Of Christmas (pdf). salvos.org.au. Archived from the original on 22 January 2012. ^ Tsirimokos, Natalie Guy Sebastian @ Canberra Southern Cross Club. outincanberra.com.au. Archived from the original on 22 January 2012. ^ Aria No.1 Awards. Australian Recording Industry Association. Retrieved 5 June 2010. ^ Closer To The Sun Tour 07. Guy Sebastian official website. 7 December 2006. Archived from the original on 22 January 2012. ^ Guy Sebastian Launches Acoustic Tour This Week. Guy Sebastian official website. 8 October 2007. Archived from the original on 21 January 2012. ^ Guy's On Fire: More Memphis Tour Dates. Guy Sebastian official website. 25 January 2008. Archived from the original on 22 January 2012. ^ Guy Sebastian 'Live & By Request' Tour. liveguide.com.au. Archived from the original on 22 January 2012. ^ Bigger Stronger Better! Guy Sebastian official website. 3 April 2007. Archived from the original on 22 January 2012. ^ "Shane Filan, Shane Filan Meet, and Guy Sebastian at O2 Shepherd's Bush Empire (01 Oct 2017)". Songkick. Retrieved 20 September 2017. 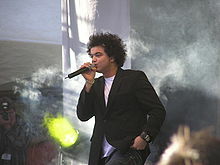 Wikimedia Commons has media related to Guy Sebastian.